As you probably know, miniatures and a grid are generally assumed by Fourth Edition. They are not strictly speaking required for playing a 4E game (it is possible to run 4E combat entirely using imagination), but my players seem to like using the battle mat. Using miniatures is relatively new for me, as we never used minis back in the 90s when I played Second Edition. Everything was imagination and description, with the occasional sketch for clarification. I currently use a Paizo GameMastery Flip-Mat. This is a dry-erase battle mat with dimensions of 24 x 30 inches. Now that I think about it, it seems like I would save myself some time if I used these same dimensions on my one page dungeons. I suppose this should be one of those self-evident things, but took me 9 months to realize (I my defense I’ve also been running lots of converted modules written for other systems). Defaulting to this size doesn’t restrict the overall size much, though it does place some constraints on individual rooms and encounter areas, as 5 foot squares results in 120 x 150 feet. This is really not that large of an area. 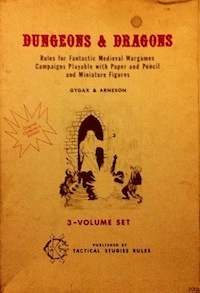 One danger of mapping to the mat is that players might figure out that maps tend to have these dimensions, and thus engage in metagame reasoning (“we should turn left here because that side of the mat is unexplored”). While I don’t consider metagame reasoning to be inherently bad, I do think it can take away from immersion in some cases, especially if it is happening during play (as opposed to deciding which feat to take or something like that). To combat this, one should periodically make partial battle mat maps. Keeping the overall dimensions in mind is still useful though, even in this case. I have had two other ideas recently regarding handling the battle mat and miniatures in play. The first idea is to delegate the mat drawing duty to a player rather than doing it myself. I think this might speed things up and also increase player engagement. They would need to create the tactical map from my verbal description, though I could of course correct obvious inaccuracies. This also reminds me of how James from Grognardia has his players assist with creating models of dungeon areas while he is engaged in verbal description. The second idea is switching to a gridless battle mat. I think there is good value in being able to see spacial relationships. What I’m less sold on is the numerical calculation that comes with counting movement squares and areas. I feel like this is the part of grid play that can potentially hurt immersion and game flow. It allows a sense of certainty that should not be present in a combat situation. For example, if you know the enemy has a move of 6 and you are 7 squares away. Now, one could always break the rules and vary NPC movement rates (or really anything) but I don’t like doing that. I’d rather have a bit of uncertainly built into the basic experience, and I think using a gridless mat might help with that (using common sense for things like movement distances and effect areas). This entry was posted in Uncategorized and tagged technique on May 9, 2012 by Necropraxis. I have a couple similar mats. In a dungeon, I have my players map for themselves on graph paper, while I only use the mat when there’s a battle going on. Description works fine most of the time. It’s only in combat when I feel like players ought to have a visual representation of their environment. That way if they want to do something like jump on a table to get a better vantage point for firing into melee, they know whether or not they have to expose themselves to opportunistic orcs on their way there. Back before we went with a completely digital projected map, it was the responsibility of one of us in the group to draw the map(s) on the dry erase mat. It worked quite well and freed up the DM for description. It also made things move a bit faster (on the whole) because the DM only had to fix the BIG inaccuracies. He didn’t have to stop EVERYTHING and sketch out the map, counting 5′-squares for himself. You can get these large pads of paper with 1″ squares printed on them at office supply stores. I think they are 3′ by 2′ or something similar. I used them for years when playing 3e. I would predraw them map on the sheets and then cut the sheet up into sections for each room. Placing the room down as the players found the area. It didn’t take away any game time and because I was drawing them before the game started, I could really take my time making the area look good and adding other elements such as fallen logs, firepits, rocks or cracks in the dungeon floor. Things that would make the ensuing battle more tactically interesting. Finally, I just started designing my dungeons on these maps themselves thus saving me even more time. Hey, that’s a really good idea. I might try that. The only danger is that I can see myself spending way too much time on detail during preparation. Do you still have any of them? I would be curious what they looked like. Might be a good subject for a blog post. We used the tabletop and a ruler last time we played D20/4E, which seemed to work well enough. I just have a couple of whiteboards and use them on the tabletop when needed. I tend to go by imagination most of the time, have a composition book and sharpie handy for clarifying sketches, and use the whiteboards for the occasional dungeon crawl or raid on a space station. We can leave them there for several sessions, and a bunch of dry erase markers are cheap.